I love fried chicken. You love fried chicken. Who among us, or at least among those of us who eat meat, doesn’t relish the first bite into a crunchy, piping hot piece of fried chicken, straight from the fryer? The love of fried chicken in this country is about as universal as it gets—only general concepts such as “burgers” or “pizza” have more reverence and cultural cache. So why, then, is it seemingly so difficult to find “really great” fried chicken? You know, that chicken with perfectly crunchy skin, just the right blend of seasoning and spices, and meat so juicy and moist that it drips down your chin and necessitates extra napkins? Why is the search for fried chicken so often mentioned in hushed, reverent tones? Why do some locations where it can be found have all the pomp and circumstance of the last resting place of some kind of Holy Chicken Grail? Well, perhaps it’s because no one can quite agree on what “really great” fried chicken means in the first place. The truth of the matter is that despite the nigh-universal love for fried birds, few consumers agree on exactly what makes those birds great. The methods of chicken preparation and cooking are as varied as the chefs, restaurants and clientele where they can be found. Some birds are brined for days, or soaked in buttermilk leading up to their big moment. Some are lightly dusted with flour, au naturale, before being shallow-fried in cast iron skillets long honed for exactly this purpose. Others are given coats of breading thicker than a Chicago winter coat, and fried crisp in the deep fryer. Who are we to say which is truly “best”? And that’s the reason I’m not trying to find the absolute “best” chicken in my adoptive city of Atlanta—a place where chicken is so frequently consumed that there exists an entire Instagram account dedicated to documenting photos of the discarded and mysterious chicken bones that litter our streets. No matter where I went, there would always be another potential stop waiting around the corner. Rather, let us relish the experience of seeking out great fried chicken—the locales, the people, and of course the birds. This is my FRIED CHICKEN DIARY. Matthew’s Cafeteria is the archetypal meat-and-three of your Southern childhood dreams. Don’t know “meat and three?” It’s the term to designate that particular brand of southern cafe known for their butter-slathered side dishes just as much as the proteins—the titular “three” that accompany your slab of meat, which may be meatloaf, or pot roast, or perhaps a chunk of country ham the size of a football. Health is not a concern at a proper meat and three. Vegetarian? Best to stay away from the green beans or the carrots, given that pork fat likely constitutes 30% of the serving container by weight. Fried chicken, unsurprisingly, is an institution here, although only available for lunch on Tuesdays and Fridays. I arrive on a Tuesday, and am promptly rewarded with a fresh bin of chicken—the best sight you can see while standing in line at a meat and three, and a guarantee that your bird is at its freshest. The golden crust is thick, crunchy and delicious—well-seasoned with salt but not particularly distinctive in terms of spice. It’s the highlight of the bird, which unfortunately can’t live up to its crispy exterior, hiding meat that isn’t nearly as moist or flavorful as it could be. Rather, I’m struck by the sheer size of these two pieces, the drumstick in particular. Is this the largest chicken leg I’ve ever eaten, in terms of sheer meatiness? It reminds me of the fabled KFC “Mega Leg” referenced by Patton Oswalt in the closing encore segment of his 2011 album Finest Hour—certainly bigger than any kind of sane God could ever have intended chickens to grow. Now, if only it could match the verve of the crust in terms of flavor, but on some level this is what you expect from a proper meat and three—this is a place where QUANTITY becomes paramount. Glance around, and you’ll see the beltlines to prove it. Fine-dining fried chicken is an odd beast. It’s a foodstuff historically and classically defined by its accessibility to the common man—chunks of hastily butchered bird, thrown into a cast iron skillet with a bit of flour and placed in a brown paper sack for picnic consumption, none of which implies an expensive meal. This is the platonic ideal of “fried chicken” that still would appear in the minds of many Americans when those words are uttered. But there is indeed room in the chicken world for “fine dining fried chicken” as well. Watershed is one of the Atlanta restaurants most famous for positioning fried chicken as an art form, placing it on a menu alongside $32 salmon or tuna entrees, although it should be noted that the once-a-week chicken (only on Wednesdays) is a mere $16, although this is sans sides. Still, with a side or two (in addition to a pair of superlative biscuits that I’m still dreaming about now), we’re talking about a price that is an order of magnitude greater than even the most gilded meat and three. And for fried chicken, that’s still pretty unique. A single thought flashes through my mind as I walk into the dusky, candlelit interior of Watershed: “This is, by no small margin, the darkest place I’ve ever ordered fried chicken.” The differences between this locale and that of Matthew’s Cafeteria could hardly be more dramatic—the Wednesday evening dinner crowd here are clean-cut, professional young urbanites, a species almost wholly apart from the lunchtime seniors of the meat and three … aside from a shared fried chicken appreciation, of course. It’s just that here, your fried chicken is probably being washed down by a well-aged California cabernet rather than a tooth-meltingly saccharine glass of sweet tea. The fried chicken of Watershed is all about simplicity, coupled with patience in preparation. On the first day, it soaks in brine, which works to season and penetrate the meat as deeply as possible. On the second day, it’s another 24 hours of buttermilk soaking. It’s only on the third day that the bird is dredged and shallow-fried in lard, which is further perked up with chunks of country ham for flavor. It’s here that the chicken really makes a unique statement—the kitchen staff are quite conservative in their use of flour, which means a relatively thin, modest crust, which you might say crisps rather than crunches. A modest difference on paper, perhaps, but key in practice, as it makes no secret what is meant to be the star of this dish—the meat itself. The payoff is juicy, tender flesh across all four pieces (quite a pile, really), although even at this level, one fried chicken truth remains constant: The leg and thigh still easily win in terms of sheer succulence. The day I come across a chicken breast that can beat out those two pieces of meat is the day I swear my allegiance to a new white meat overlord. Let me make one thing clear: Chicken wings really deserve an entire diary of their own, and especially in Atlanta. Wings are a big deal here in my adoptive city, and you’re never more than a stone’s throw away from one of the hundreds of independent or chain wing shops that proliferate on street corners and semi-sketchy strip malls. If you’ve watched Atlanta on FX, perhaps you’ve gotten a sense for this, and also learned about the flavor that rules the roost throughout Atlanta: lemon pepper. Like Italian sausage pizzas in Chicago, the lemon pepper wing is Atlanta royalty, and for good reason—lemon pepper wings are delicious. In fact, the first season of Atlanta memorably featured an unusual diversion from the typical lemon pepper formula—the mythical “lemon pepper wet,” although for the purposes of the story the wings were wrongly attributed as coming from local Atlanta wing establishment J.R. Crickets. In reality, the original “lemon pepper wet” wings originated elsewhere, at American Deli. As far as chains go, American Deli locations are about as nondescript in appearance as they come. They look cobbled together from the scraps of numerous wing shops, burger bars and hot dog stands, and you’d never really guess to look at one that the chain is considered one of the better places to reliably get high-quality chicken wings in Atlanta. It’s something I was ignorant of myself for several years after moving to ATL—an American Deli storefront is just an easy thing to overlook. But if you really want the original “lemon pepper wet,” this is where you have to go. And if you’re going to write about bone-in fried chicken throughout Atlanta, you need to at least acknowledge the ascendency of the chicken wing at some point. I’m here to kill two chickens with one stone. The sauce of “lemon pepper wet” is essentially clarified butter, lemon pepper and perhaps lemon juice, because who cares about cholesterol, right? The result is that each wing is explosively flavorful—very salty, very tangy, very lemony, very everything. The skin of each flat or drumette is crispy and intensely flavored, to the point that a fairly modest 10 wing combo feels like a massive overindulgence. “Subtlety” is nowhere to be found here, only wish fulfillment for those who enjoy the spice and tangy quality of lemon pepper. The only clear criticism to be made is the size of the flats themselves—almost invariably the better part of the wing (never trust someone who says they prefer drumettes), they’re a bit skimpy here in the meat department, which puts an already saucy and salty wing in danger of becoming completely out of balance. But that’s how the clientele likes them, and that’s how lemon pepper wet will remain. P.S. – The crinkle fries are substantially more addictive than you would ever expect possible. Every city has that one ancient cafe or diner that is infused with prestige on a very deep, primordial level. The kind of places visited for photos ops by the powerful and the influential (actors, athletes, politicians) over the decades, but primarily tended to by the working class—the people who really pay the bills and keep the doors open. Every city of note has one of these establishments. And in Atlanta, that’s the Busy Bee. It might be easier to note the celebrities and historical figures who haven’t visited the Busy Bee than to recount all of those who have. Barack Obama dined there. So did Martin Luther King Jr. So did seemingly every pro athlete or musician who’s ever passed through Atlanta. And you can be damn sure that most of them were drawn there by the prospect of the best fried chicken in Atlanta. And on that front, Busy Bee delivers emphatically. Make no mistake; Busy Bee is an iconic establishment for Atlanta’s black community in particular. On the day I stopped in to dine, the small, beloved cafeteria had just opened its doors minutes earlier, but the Sunday morning church crowd had already filled it to the brim. Men, women and children on their way home from local black churches on the west side of Atlanta streamed through the doors, eyeing valuable space at the countertop and picking up carry-out orders with hilariously long lists of side dishes and sauces. The pitter-patter of conversation recalls the one-upsmanship from Key & Peele’s classic “soul food” sketch, as everyone seems to be attempting to outdo each other by consuming progressively larger piles of gravy-laden starch and meat. One can only assume that virulent cases of The Itis are a common result, if The Boondocks is to be believed. The chicken, in a word, is phenomenal. It’s what fried chicken obsessives dream about, but don’t dare to expect, when they see the words “fried” and “chicken” on a menu. A thin, but extremely crunchy crust produces a joyful shatter with each and every bite. It’s very well seasoned as well, not just with salt but with a melange of spice notes that are so much more complex than they would ever need to be in order to satisfy most patrons—I’m sitting at the counter eating a chicken leg, debating in my head whether I’m picking up on notes of nutmeg or smoked paprika. In reality, it could be neither, but that doesn’t make the chicken any less fabulous. The flesh, likewise, is juicy and seasoned all the way through. It’s beyond reproach. There’s nothing else to say. Ask Barack Obama; he’ll agree with me. It’s been fascinating to watch the ascendancy of Nashville “hot chicken” on a national stage, has it not? Only a couple years ago, hot chicken was just another regional dish, ‘ala Mississippi’s “slugburgers” or Rochester, NY’s “white hot dogs.” But after riding a wave of popularity and exposure, even national fast food chains like KFC are now hawking hot chicken, to the point that the public has come to understand quite well what this fried chicken subgenre represents. As such, it was only natural to inject a little hot chicken into my fried chicken diary. Richards’ is an independent fried chicken stand that was fortunate enough to simultaneously latch itself onto two separate crazes in American food culture: hot chicken and “community markets/food halls.” In the time since I moved to Atlanta in 2014, this concept has come on in a big way and proved massively successful on a local scale: They simply find a large, unused building (like a former factory or office building) and fill it to the brim with food kiosks, vendors, booze and yuppie-friendly shopping. What’s not to love, aside from the crowds? The second Richards’ chicken comes out of the kitchen, it’s immediately obvious we’re dealing with a different type of fried bird here. 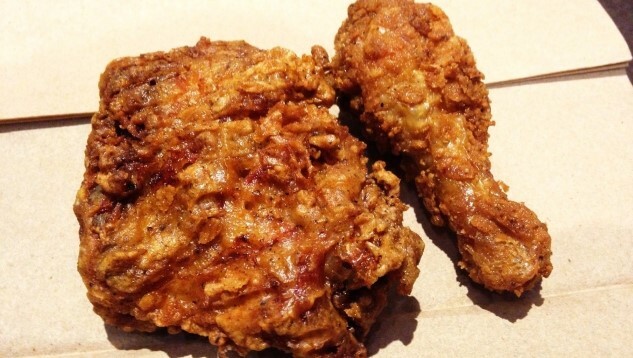 The color is a dark mahogany, mixed with brick red, presumably the result of both the spicing and a longer session in the fryer to build a darker crust. It’s also noticeably oily—you can see little pools of oil collecting in the crannies of the crust, along with a sprinkling of what appear to be chile flakes. If you didn’t know better, you might actually think it came from the Sichuan Chinese stall instead as a result. As for the “hot” part of the equation, it’s certainly not a misnomer. I’m eating the medium heat level on this occasion, which isn’t exactly fiery the moment it hits the tongue, but then steadily builds throughout until extra napkins are needed to wipe the sweat away from the brow. The crust is crunchy, thick and extremely flavorful, tearing away in large chunks. The first thing one notices, oddly enough, isn’t exactly the heat but the sweet—there’s clearly a lot of brown sugar involved in either the marinade or breading, which probably contributes to both the caramelized appearance and the sweet-and-spicy crunch of the skin. Regardless, it’s a pretty nifty change of pace that doesn’t take away from the juicy, succulent dark meat underneath. Fun fact about that piece of chicken on the left, by the way: That’s a thigh, not a breast. Undoubtedly one of the biggest, meatiest chicken thighs I’ve ever encountered. I’ve already explained the phenomenon of the “food hall” above, but it occurs to me now that fried chicken may very well be the perfect food hall dish—it’s familiar to any consumer walking by, and you can prepare it cheaply enough to make it a reasonably priced option, even with a decent mark-up. You can even embrace the laissez faire attitude of some pizzerias by making everything completely ‘ala carte—just name which pieces of chicken you want, and someone walking by can snag a drumstick for a snack. As I said above, it’s a format that easily fulfills one’s more hedonistic impulses. All of those things are true of Hop’s, a fried chicken stall anchoring the center of Atlanta’s second major community market/food hall, Ponce City Market. Situated at the midway point between two shops selling incredibly overpriced home goods and $300 dutch ovens, they’re serving up ‘ala carte, by-the-piece, Southern-style fried chicken to passerby, which is certainly a nice little feature for the dark meat devotee such as myself. Why yes, I would like a leg and a thigh, thank you very much. Hop’s chicken immediately strikes me as a happy medium between several of the styles I’ve already had in the course of this fried chicken diary. The breading is very thick and crunchy, breaking off into large, multi-layered shards with every bite. It’s well-seasoned but a little bit on the chewy side, with a large amount of black pepper giving it hints of genuine heat—probably the most pepper-forward pieces of chicken in this diary. The flesh is in the middle in terms of juiciness/tenderness, although I must give props for the thigh, which was extremely succulent. All in all, a few well-balanced pieces of chicken, but the sheer thickness of the crust means this one would primarily appeal to the chicken skin lovers. With that said … who among us isn’t a chicken skin lover? As someone who once constructed a sandwich made entirely from chicken skin (why am I admitting this? ), it would be morally bankrupt for me to minimize its appeal. We close out my immersion into Atlanta fried chicken culture with one more dip of the collective toe into the waters of fine dining fried chicken. Decatur’s Revival is something of an oddity—an upscale restaurant that focuses entirely on the same kinds of Southern classics typically found at the meat and three—your fried chicken, your meatloaf, your catfish, etc, except at a premium of panache (and expense). Unlike, say, Watershed earlier on this list, Revival isn’t a “modern American” restaurant that happens to serve some Southern specials; it’s a Southern restaurant that purports to make elevated versions of “grandma’s recipes.” Fried chicken isn’t a once-a-week special here; it’s the first entree on the menu and the first thing your eyes are supposed to see. As for the pricing ($15 for the entree, all sides sold separately), it’s not immediately clear what the rationale is behind it. Is the customer supposed to make the assumption that this is a special bird? Or that the preparation is more arduous than normal? Or is it safe to assume you’re paying for the prestige that comes with eating at the restaurant of a celebrity chef, in this case, Top Chef finalist and Atlanta institution Kevin Gillespie? I still wasn’t entirely certain afterward, but I can at least report that they know how to make some solid chicken. Seated at one of the many small tables that are spread somewhat haphazardly around the antique home that houses Revival, I was presented with a stark, unique-looking plate of chicken. One first notes the darker, chestnut-tinged fry that these birds have received, which yields skin that is wonderfully crunchy. The crust is very interesting in general—very light in terms of thickness/depth of breading, but simultaneously very crunchy and uniform, holding together nicely. Seasoning is fairly minimal and old-school, with a grainy note that reminds me somewhat of the sort of cornmeal breading you might use for a piece of fried catfish. The flesh is tender, hot and juicy—as good as you could hope for. Of particular interest is the piece on the left in the photo above—that’s actually a breast, which makes it undoubtedly the smallest chicken breast I’ve seen in the course of this diary. That surprise was counterpointed by a second one: The breast was the best piece of meat on the plate! Color me shocked as a dark meat devotee, but for whatever reason, the Revival breast showed a deeper degree of seasoning and balance than the others, well-spiced with hints of black pepper and cayenne. If every piece here was on par with the breast, it could be a contender for the best fried chicken I sampled. Taking absolutely every factor into consideration, from seasoning and succulence to value and ambiance, there can be only one true winner. The fried chicken that I’ll be dreaming about and using as a baseline to compare other fried birds against for the forseeable future is … Busy Bee Cafe. This is the platonic ideal of fried chicken, and I didn’t have a single piece in Atlanta that was a more perfect expression of crisp skin, well-seasoned flesh and everything else you want in your fantasy fried chicken. On my search for fried chicken heaven, the Busy Bee bird represents nirvana. Go try it for yourself and see. Jim Vorel is a Paste staff writer who enjoys quixotic, chicken-related quests. You can follow him on Twitter.